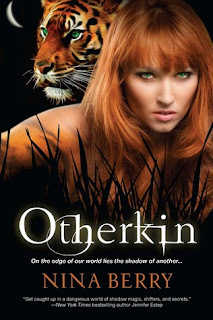 Otherkin is a very great book. Very different than most I have read, because here, the characters shift into animals! Being a lover of animals, it was very fun to see what animals each character shifted to, and how they acted in their animal form. Nina Berry did a great job in writing about the animal's feelings, because it felt so real! Everything was so detailed, and I think she did a great job in writing this book! Dez, the main protagonist, has felt out of place all her life. Being adopted into a family, (but a very loving family), and wearing a back brace, and not being able to fit at school. She also doesn't know that she can shift into a lion. Until the day where she gets kidnapped and finds herself locked in a cage. Locked in the cage beside her, she meets Caleb, and that's when she knows everything about herself and her new enemies. The adventure in the book starts immediately, and I'm glad I didn't have to wait for the story to start. It was action after action, which never left me bored. All the characters felt relatable, so I really enjoyed reading about each and everyone of them. What I really liked about this book is that it wasn't predictable. It didn't go with the flow of most books, which made me enjoy it more! I don't want to say much about this book, due to not spoiling things, but some parts made me really laugh as well. Caleb was the type of guy who was hard to understand. He wasn't a shifter like Dez, but a caller. Despite their differences, I really liked how the two worked together, and developed their trust for each other. Later we meet the other characters in the book, or shall I say, the other Otherkin. Nina Berry did a great job in the world building, and the fantasy in this book was great! The romance was the exact touch we needed. Not to much and not to little. I have to admit that some parts in the book were confusing to understand. The fighting, and the magical part of the story wasn't clearly described. Sometimes I would find myself skimming through those parts, just to get to the good parts. Anyhow, I really enjoyed reading this book. From the characters, to the world building, everything was fun and enjoyable to read. The ending was good, but it did leave me wanting to know what happens next! I cannot wait to get my hands on the sequel of the book, Othermoon! This sounds interesting and I kind of like the shape shifter element to the story. I'll have to add this to my list! I read some others also say that the fighting scenes could be confusing. I really like the cover of this one and I won a copy from LibraryThing, so I am looking forward to reading it. Amazing review! :) I really loved this book! I keep seeing this one at the store. I've read adult novels with somewhat similar theme but nothing that was YA. So I guess I'm curious. These kinds of stories are easily confusing. It doesn't take much to feel like I don't really understand everything. But I don't think that would keep me from reading it. I'm glad that it was mostly good though, I may not be able to resist picking this one up in the future! Ooooo I do love a good shifter story! I'm a huge fan of shifters, and devour every book about them that I get my hands on:) Despite the confusing magical elements and the fighting, I really like the sound of this one, and I think I could do what you did and skim through some of those murky areas and get to the good parts. Thanks for the review Farah! Another book I haven't heard about, but shifters! Love urban fantasy!